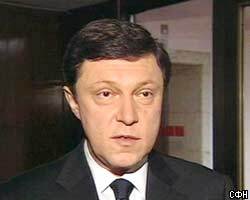 The Yabloko party will not nominate its candidate for the presidential elections in March 2004, because it believes that, in the present political situation in Russia, fair and equal elections are impossible, Grigory Yavlinsky, the leader of Yabloko, said after the party's congress at the weekend. In his opinion, Russia lacks an independent judiciary, politically important independent media and the possibility to obtain independent financing for election campaigns. "The recent parliamentary elections demonstrated an excessive use of the so-called administrative resource," said Yavlinsky. Speaking about the forthcoming presidential elections, he said their format and terms were "unrealistic". Commenting on the possible boycotting of the election, Yavlinsky said the party would make a special decision on the issue. The right-wing politician said his main goal over the next four years was "to build a large democratic party that would act as an opposition outside the State Duma". "Russia does not have such experience today, but we will learn how to do it," he noted. Yavlinsky stressed that Yabloko would cooperate with all democratic parties in the country and would take part in all regionall elections, including regional legislative assemblies. He said that over 300 delegates from 75 regions of Russia had taken part in the congress of the party. Yabloko failed to pass the 5 percent threshold, required to gain representation in parliament, in the last parliamentary elections. The party calculated the votes independently from the Central Election Commission, and it said the results announced by the Central Election Commission did not comply with reality. Yavlinsky said on December 9 that the election campaign to the State Duma had been "dishonest and marred by irregularities". In particular, he said, the campaign was marred by media bias against political parties and blocs, especially on central TV channels. "Administrative resources were used more than ever, both in the presentation of the parties and during the process of vote counting," stressed Grigory Yavlinsky. "Yabloko conducted its best election campaign," he added. In his opinion, all parties that made it into the Duma, represent 'theparty in power' in their attitude to a number of key issues. Moreover, two thirds of the Duma "are simply the continuation of the government's and the president's offices". This is another step towards the elimination of public politics in Russia, in the opinion of the Yabloko leader. Nobody in the Duma would represent the interests of citizens rather than the interests of the authorities, he added. It was suggested both before and after the parliamentary elections that Yabloko should unite with another right-wing party, the SPS (Union of Right-Wing Forces), which also failed to pass the 5 percent threshold, and that the two parties could nominate a single candidate for President. However, this did not happen.